In typical Robyn fashion, I haven't knitted a stitch on the sweater since I posted the picture a few days ago. I don't know what it is about me, but sometimes I just can't make myself finish projects. I started a new hat last night out of some handspun I bought off of etsy. 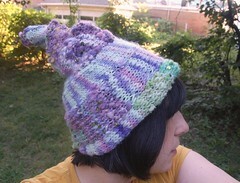 The pattern is a modification of the Ice Cream hat from Intertwined . I changed the pattern by increasing the width of the strips, making it seamless by picking up a stitch from the lower level and knitting it together with the first stitch on the needle at the beginning of every row, and making the hat in an adult size. Technically, this kind of hat could be made with any type of yarn, but I think it looks best when done with thick and thin handspuns. I knit the hat with every intention of the knit side being the outside of the hat, but I really like the way the purl side looks so I haven't decided which side will actually go out. In other news, Philip bought Rock Band and we are completely hooked. It's really hard to pack up the apartment when you can pretend to be a rock star instead. My sister and her boy friend are too busy playing rock band instead of cleaning out the house they just bought and finishing up their wedding plans...They're getting married September 13...and all they do is play rock band. It's like crack, so I'm told. ummm... can i play rock band with you? pretty please? Of course, everyone is invited over for Rock Band after we move (that's two more weeks.) We aren't even unboxing the drum set until we get to the new place. Zabet and Patrick are buying a second guitar so we will also have bass after we move. I am so excited!! !